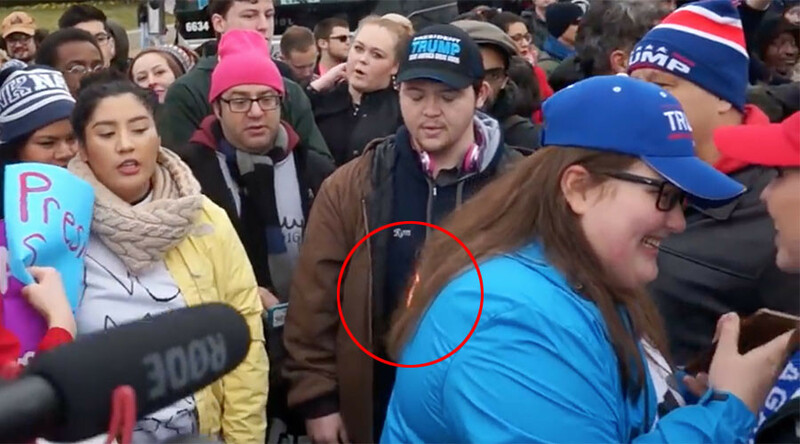 A video of a lively but peaceful protest and exchange among anti- and pro-Trump supporters turned nasty when a young woman’s hair was set on fire. A video of the incident, which occurred Friday, emerged over the weekend. Luckily friends were on hand to put out the flames, but there have been calls to find the fire starter. The assault takes place at the 1:14 mark on the video when a Trump loyalist in a blue hat poses for a selfie next to an anti-Trump protester’s sign. When she walks away, her hair is on fire but is quickly put out by a male Trump supporter in the crowd. The video zooms in and slows down for the moment when a hand with a lighter is shown extending through the crowd to torch the girl’s hair. The culprit appears to be a female wearing a blue hat. The edited video includes comments from posters throughout and begins with the opening statement: "This happened on Inauguration Day in Washington DC just after Donald Trump was sworn into office. Everything had been fine up until this moment, and it just comes to show that 'Peaceful' Protests aren't always what they seem to be." Other commentators said they have reached out the DC Metropolitan Police to complain about the incident. The incident happened just three days after an anti-Trump supporter set himself on fire outside Donald Trump’s International Hotel, according to the Washington Post. Staff at the hotel called the police. The man suffered non-life-threatening burns and was taken to hospital. Witnesses described how he yelled “Trump” several times as “flames ran up his back” before lying down in the street. DC police told reporters he was not arrested.